The eyeshadow is supposed to be a cream, but it feels more wet, like a gel. It's basically just a lot of green glitter in a clear base. The eyeliner glided on nicely, but I'm skeptical about the staying power of both of these. I guess we'll see. Sunday, I decided to head to Ross to see if I could find any Color Club sets since I've been hearing that people have been able to find them there. Score! Electro Candy and Untamed Luxury Covered in Diamonds, $8 each yay! There was another set of glitters, but I resisted because I already own almost all of them, haha. There were also a few incomplete sets. 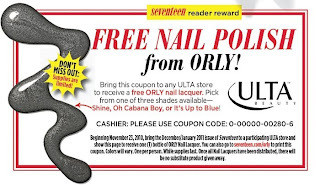 Click the picture, print it out, and take it to the nearest Ulta to pick from a selection of three colors! Hopefully it's not too late! Shine is a silver foil (bright and shiny, not dark like the picture shows), Oh Cabana Boy is a neon pink, and It's Up To Blue is a pretty teal shimmer. Very excited to try all the colors!